Welcome to the Panzer Digest Review Special, a special edition of the magazine containing of all the thumbnail reviews appearing in the first nine regular issues of the publication. Over four dozen reviews from over twenty publishers, are included in these pages. Reviews are divided up according to era, including Modern, WW2, WW1, 19th Century, Pre-19th Century, and provide opinions and informed observation about a wide variety of games and systems. 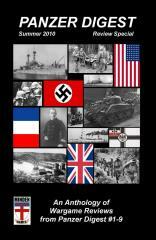 Wargames of all stripes will enjoy what the Panzer Digest Review Special has to offer.